Buy New Panasonic Lumix DMC-FT30 Tough Waterproof 26feet Digital Camera (Black), Free 8GB & Case At Best Price at FotoZZoom! The Panasonic Lumix FT30 is a new, ruggedly built 16.1-megapixel camera with a 25-100mm equivalent lens. Dustproof, waterproof to 8 metres, shockproof to 1.5m and freezeproof to -10 ℃; the new FT30 sports a 2.7" LCD screen and a new Torch Light function for illuminating the subject in dark underwater conditions. With the Creative Panorama function you can shoot a horizontal or vertical panoramic image, while Creative Control and Creative Retouch modes featuring a total of 12 filter effects give you the tools you need to enhance any scene you’re looking to take a picture of. The Panasonic Lumix will be available from March, at an RRP of £139.99. 5th January 2015 – Panasonic has today introduced a new rugged camera to its waterproof, freezeproof, shockproof and dustproof tough camera range, the LUMIX FT30. 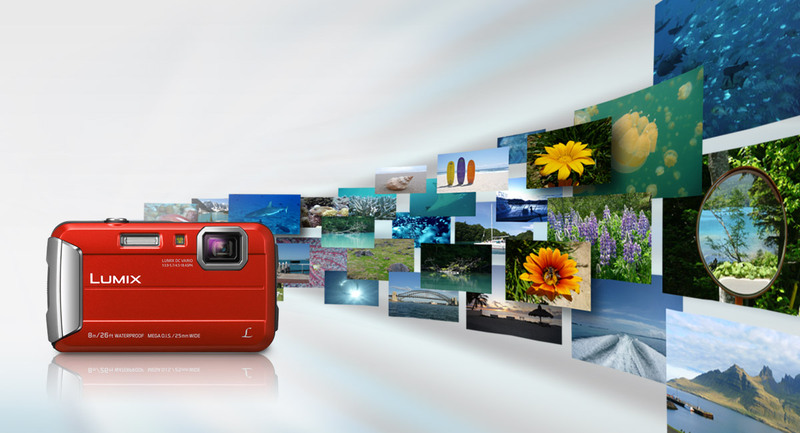 Designed and built with adventurous personalities in mind, the LUMIX FT30 provides stunning picture quality and exceptional performance and endurance, even in the toughest conditions. 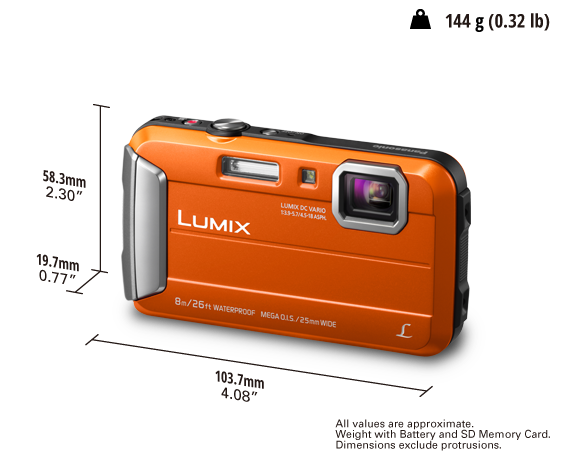 Ruggedly-built and available in black, blue, red or orange, the LUMIX FT30 is the ideal companion for capturing those once-in-a-lifetime moments on your travels – from snorkeling with dolphins, to trekking in the desert, to ascending a mountain in sub-zero temperatures. during outdoor adventures. This model is optimal for both. NOTE - Temperature: 23 oC (73.4 oF)/Humidity: 50%RH when LCD monitor is on. NOTE - Using a Panasonic SD Memory Card (32 MB). NOTE - Turning the camera off every 10 recordings and leaving it until the temperature of the battery decreases.